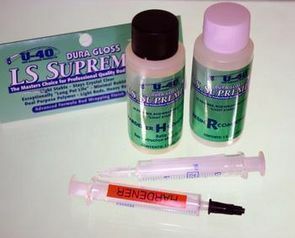 LS Supreme is a medium viscosity system, completely self leveling on the most complex of wraps. It is totally bubble free without the use of heat. It is resistant to Ultra Violet deterioration, and is non-yellowing in the most severe sunlight conditions. 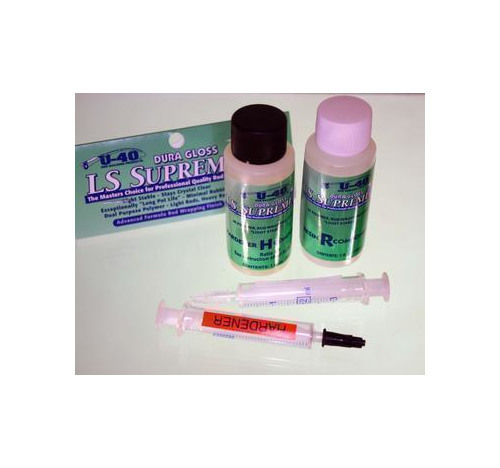 LS Supreme has a very long working life, yet it will cure tack free in 4 to 6 hours at normal room temperatures. It will penetrate and completely wet out 2 layers of thread. LS Supreme cures with great clarity. It stays remarkably clear indefinitely. It will never become brittle and will remain flexible forever. It is truly the epitome of rod finishes.